...it’s the perfect cookbook for those who love wine but don’t quite know where to start in terms of creating food to match. The wine lover's and food lover's playbook, with 75 wine styles and 250 producers to try with 75 recipes that go with them perfectly. "Wine food" is the new way to talk about wine pairing, coined by the evolving breed of wine drinker and cook who wants to discover a wider range of wines and match them to the rustic, casual, global food they love to eat. 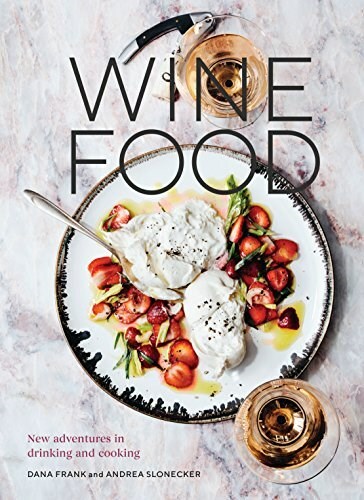 In Wine Food, sommelier and urban winery owner Dana Frank partners with professional cook Andrea Slonecker to deliver 75 recipes for brunches, salads, vegetable dishes, picnics, weeknight dinners, and feasts with friends, all inspired by delicious, affordable wines that go with them beautifully. Each recipe opens with a succinct overview of the wine style that inspired it, describing the grapes and naming the countries the wine comes from, followed by a brief explanation of how it complements the flavors and textures in the recipe. Recommendations for three to eight producers for every wine style highlighted will help cooks find a wide range of bottles in corner wine shops, grocers, and online. Frank and Slonecker also include a wine flavors cheat sheet, a label lexicon lesson, a short course on wine tasting like a pro, and illustrated features on matching wine with types of favorite foods (typical take-out, beloved pasta dishes, and popular sweets). With more than 75 atmospheric and recipe photos and 20 watercolor illustrations, Wine Food makes wine education experiential, fun, and especially delicious for wine drinkers of all knowledge levels.